Octagonal heavy-duty crushproof couplings. Continuous flow tube keeps water flowing even if kinked. Metal spring collar prevents kinking at faucet. Anti-bacterial lining prevents deterioration and extends hose life. Sprayer/Hose/Nozzle Type: Hose; Hose Diameter: 5/8"; Hose Length: 50 ft; For Use With: Standard Nozzles. 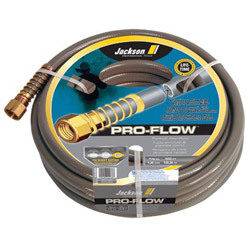 Garden Hoses and Accessories from Jackson Professional Tools! 444 In Stock today.